We are possibly one of the UK’s leading personal development organisations focussing on and listening to what you, the customer wants, rather than what feels right to us. A game played outside; but mostly inside! 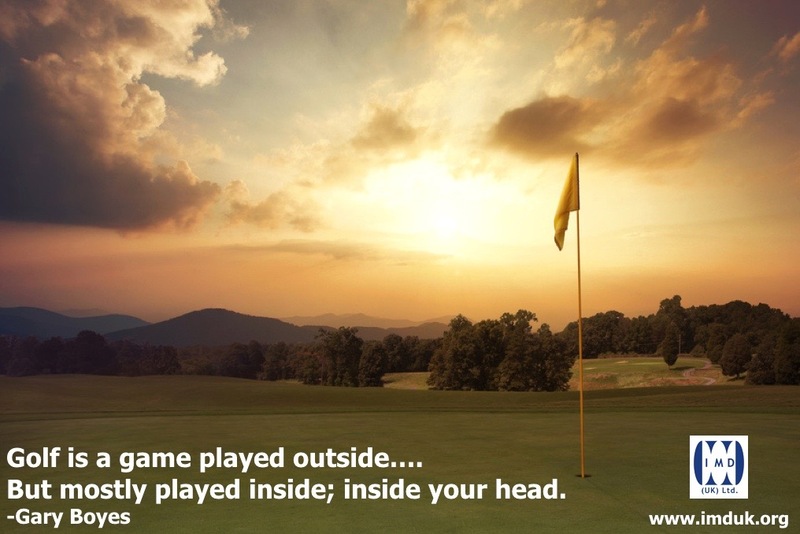 Golf is a game played outside; but mostly played inside; inside your HEAD. I recently had the fortune to spend some time at a golf seminar with Geoff Loughrey from the Michael Bannon Golf Team. 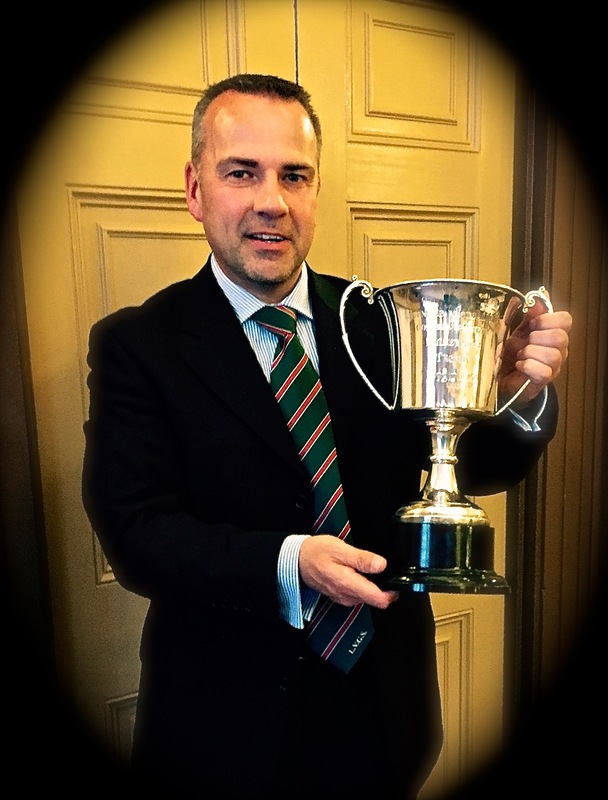 Now, for those that don’t recognise that name, Michael was the PGA professional at Holywood Golf Club where he started working with 4 times major winner Rory McIlroy as a junior member, and continues to work with Rory to the present day. Geoff was Michael’s assistant at the golf club, where he trained to become a PGA Pro. It was interesting to hear about Rory’s early years and especially a view inside the mind of McIlroy! Now, it must be said, that if the right mindset was paramount for top sports people, then surely the same can be said of top business people? Clearly this is the case and I honestly believe that even business aside, the right mindset can help you achieve in every facet of life. Just what special ingredient do you have to have to become number 1 in the world, in your chosen profession? What is it that stands the achievers from the also-rans? It was evident, from a very early age that McIlroy had a desire to become world number one, and that feeling has never left him. Once he had achieved it, the goal is adapted, to stay there. During 2015, with the continued brilliance of the American Jordan Spieth and the Australian, Jason Day, snapping at Rory’s heels and claiming pole position, the desire is still burning strong for McIlroy to reclaim, what he sees as, his title. Visualisation is a wonderful tool and as a six-year old practising on the fairways of Holywood Golf Club, Rory would often visualise his name above that of his hero, Tiger Woods, on the leaderboard. So sure was he that he would achieve his dream, that when he was around 10 – 11 years old, he actually wrote a letter to Woods, introducing himself and telling Tiger, ‘I’m coming to get you’!! The wonderful Clubhouse at St. George’s Hill Golf Club, Surrey. Taken on the approach to the 9th Green. It was interesting to hear Geoff speak of the dedication of McIlroy with his practice routines and belief and that he surrounded himself with positives, in fact, those around him, his family and friends, coaches and fellow club members helped him grow up in a balanced way, always encouraging and emphasising all that was good with his game. How we could do with far more people such as that in the world! Geoff recalled a match he played against Rory the Youngster whilst he was assistant pro at the club. On a par 4, Geoff had put his ball on the green with his second shot whilst Rory had found the green-side bunker. Trying to psychologically upset McIlroy, as they both walked to the green, Geoff pointed out that he was on the green yet Rory had found the bunker. McIlroy’s response epitomised his positiveness; ‘Geoff, I LOVE bunker shots!’ to which he quickly dispatched the ball from the sand and it came to rest near the hole for a tap-in par 4. 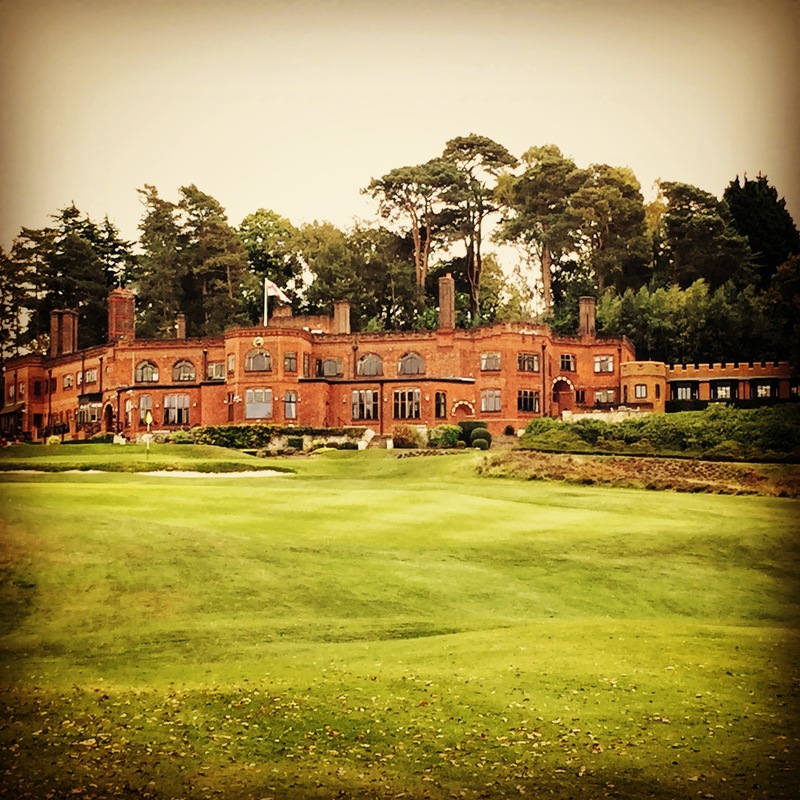 Enjoying Brockett Hall Golf Club, Hertfordshire. 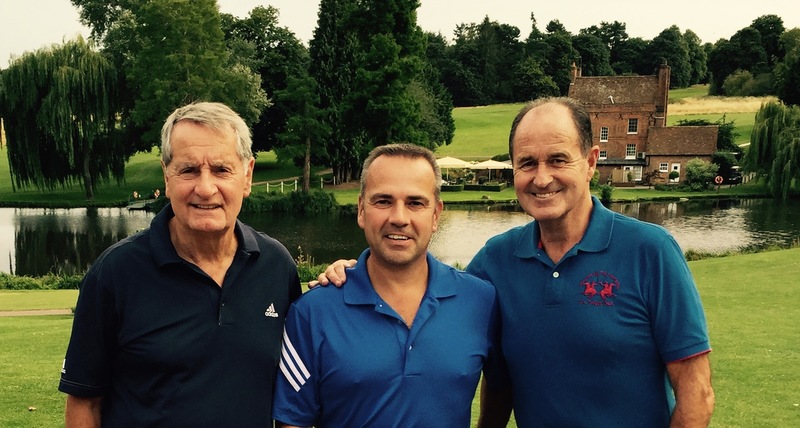 Ex-Arsenal & Scottish Internationals, Frank McLintock & George Graham, winners and successful people in their own right.. how much belief did they have at the peak of their careers? A winning mindset is crucial in whatever you do. So what can we learn from Rory’s mental approach in sport, business AND life? Instead of dreading certain aspects, learn to enjoy them, in fact, even if that seems like a struggle, start to lie to your mind…. your mind is not fussed, in fact it’s quite used to it and will steadily start to interpret the new information you are sending it. Ever woken up in the night, having dreamt (or perhaps more accurately, having a nightmare) where you are falling? Now clearly you haven’t fallen, yet your mind thinks you have, your heart will be beating faster, your breathing shallow and perhaps even a cold-sweat; classic stress symptoms, because your ‘mind’ thought you were actually falling. It is therefore perfectly acceptable to lie to your mind (but here’s a tip… tell it only good stuff)! The Millennium Trophy. Won with an incredible amount of belief and taking on brave shots! To succeed at any sport or in any business, decisions have to be made and not only do you have to make the ‘right’ decisions (or what you believe to be right decisions) you have to do so with bravery. Have you noticed how brave children are at many things, yet as we become older (and supposedly wiser) we tend to be more cautious. Ask a 10 year old child to go and climb a tree, they cannot wait to do so, and think about only reaching the top. Ask an adult to do the same, and the thought patterns are generally ‘I can’t do that, I haven’t climbed a tree for years, what if I fall’? Kids never think of that, they just focus on climbing the tree! One of my strengths in golf is putting, in fact I’m convinced I’m going to hole every putt. Many others take on the mindset of ‘get it near the hole’ or ‘what if I miss’, yet if that is the thought going through your head as you strike the ball with the putter, that generally is what you do… get it near the hole! I have a good friend who I play a lot of golf with who I’ve managed to convince that I am the best putter he’s ever played with! I enjoy a game of golf with him, as every putt I have to make, he’ll generally say, ‘You never miss these’ or ‘I may as well give that one to you’ from 10 – 12 feet, which merely builds my confidence and belief that I will actually hole the putt. Be brave, in whatever you do, it is one of the bulk ingredients of success. Paul McGinley, the guy that holed the winning putt, the tricky, 7 foot, left to right putt on the 18th Green which ensured a European victory in the 2002 Ryder Cup at The Belfry and then went on to be the 2014 Winning Ryder Cup Captain has been heavily into the psychology of golf and success for many years. Geoff Loughrey told a story of when the two of them shared a putting green prior to a tournament, getting some practice in, getting used to the speed etc. of the greens. McGinley practiced the whole time with a pair of headphones on! Loughrey thought it a bit odd, but put it down to him listening to his favourite music, to calm him and relax him whilst he practiced. After a while and during a break, he asked Paul what music he was listening to, to be told ‘Here, have a listen’. All he heard was a voice saying ‘You’re the best putter in the world, You’re the best putter in the world, You’re the best putter in the world….’ proof indeed that the more you tell yourself something, good or bad, the more engrained that becomes. I wonder what was going through McGinley’s mind as he made that winning putt to give the Europeans victory in the Ryder Cup? I’d put money it was nothing like ‘Don’t miss this’! 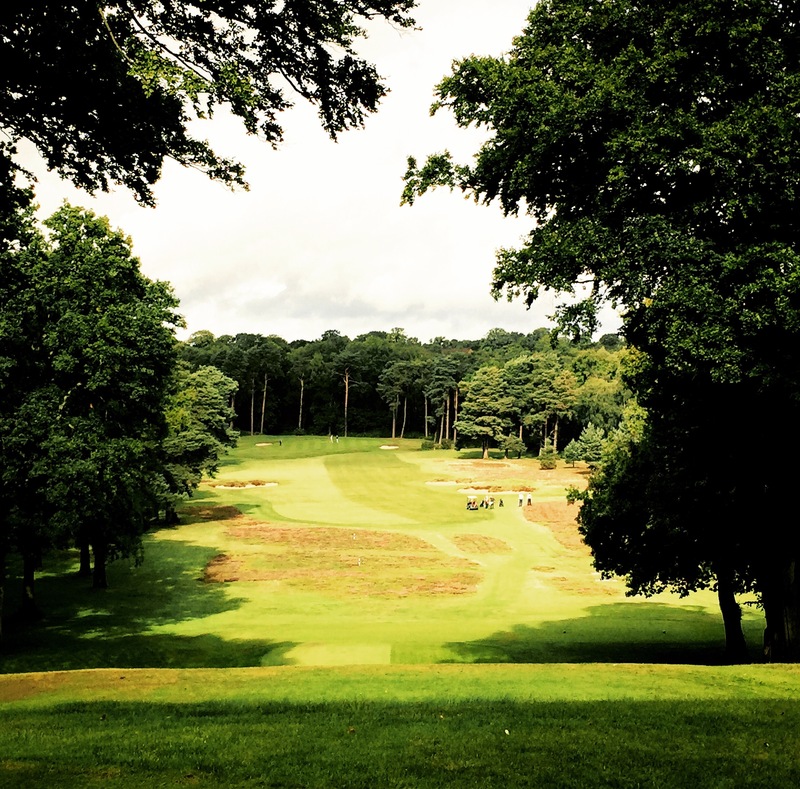 The fantastic Stroke Index 1 hole at Woking Golf Club, Surrey. A tough, but brilliant Par 4. Whether you are playing sports or, as I’ve said, want to become more successful in business, or simply want a better life, live in the positive world. Think and tell yourself things that you can do, rather than focussing on what might go wrong. Psychology surrounds us, and everyone is a psychologist! My own observations are that there are too many bad ones… people that analyse why they CAN’T do something or hark on about the fear of failure. Many people won’t know they can’t do something because they’ve never actually tried, their fear stops them at even attempting it! Crazy huh? The gem that Geoff Loughrey left me with was the story of the first time that Rory McIlroy was to play in a tournament with Tiger Woods, his hero from as far back as he could remember. Picture the scene, Woods at one end of the range, Rory at the other. As good as you are at controlling nerves, just imagine how you would feel competing against your hero and the current World Number One, and had been for a considerable time. It was clear to Michael Bannon, who still coaches Rory to this day, that McIlroy was nervous. His body language, his demeanour, there were signs of nerves. (Who wouldn’t be)! Michael told Rory to keep practising and he would be back shortly, and then, casually wandered along, as discreet as he could be, to watch Woods practising. Tiger was hitting balls seemingly for fun! His coach would say, hit a low one; and he did. Hit a fade, left to right; and he did. Now a high draw, right to left; and he did. In fact Woods was looking awesome! Michal Bannon returned to where his prodigy, young McIlroy was practising and simply said ‘I think this could be our day. Tiger’s hurt his back, I’m not even sure he’ll be able to play! He’s topping balls, and slicing drives’. McIlroy, clearly felt that maybe, yes, this was his day, and you can only play the person in front of you, whether that person is carrying an injury is really not your problem. McIlroy’s body language changed with this news, he relaxed and started to hit some great balls. After 9 holes, McIlroy was 1 hole up and asked Woods how his back was holding up! You can imagine the response, and McIlroy caught the eye of Bannon in the crowd who simply gave a sheepish grin and a thumbs up! Rory went on to win the match, having been given the belief before they even stepped on the tee, more evidence came when he was 1 up at the turn, and sometimes that is exactly what you need; Belief! How many things could YOU achieve, this week, this month, this year, with a little more belief? What pressing engagements have you got to attend, maybe make a speech or deliver a presentation? One of my favourite Muhammad Ali quotes is ‘I told myself I was the greatest, even before I knew I was’. Pure belief, and when you think about it… it works! Remember to ‘follow’ our blog, and watch out for new workshops, created and designed for exactly what you need, to be even more successful than you currently are.